Update: This is the fourth part in the series. Here are links to all the parts of Narandra Nayak’s rationalism tour of India: Intro, Part 1, Part 2, Part 3, Part 5, Part 6. 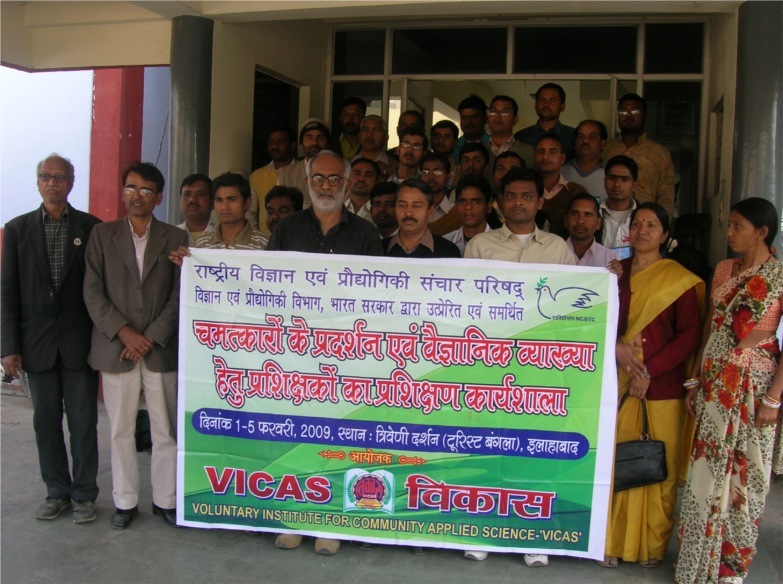 The month of Feb started with a training program for an organisation called VICAS at Allahbad, funded by the NCSTC, a wing of the department of Science and Technology, Ministry of Human Resource Development. This city is the heartland of superstition and one can imagine the magnitude of the work to be done there. When I arrived at the place on the 31st Jan, I was taken to the stall run by this organisation at the Magh Mela site, I was particularly impressed. The volunteers were showing so called miracles to passersby who had come to perform pujas at the confluence of the two rivers Ganga and Yamuna! The training program was attended by about 40 volunteers including members of NGOs and teachers. We had a great session of fire walking by the river side which was filmed by many of the local and state TV channels.The coverage by one channel, Sahra Samay, was well liked and I was invited to the studio for a one hour live interaction with the viewers of two states- Uttar Pradesh and Uttarakhand. Our displays of dipping hands into “boiling Oil” and fire walking got good coverage in the local press too. 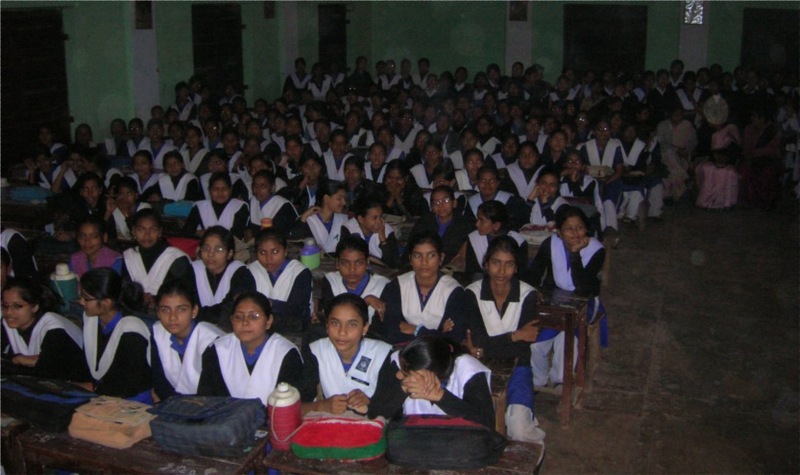 As a part of the training we had interactions with the girls at a local inter-college- Arya Kanya Inter-college. The demonstration was followed by Q @ A session during which there were a lot of questions. There was standing room only and the session had to be ended by the head of the institution because it had well exceeded the closing time. 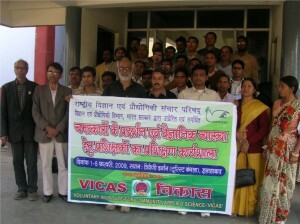 teachers and the members of the district committee of the Science for Society, Bihar. It was a crowd of volunteers starting from the thirties to people very near the retirement age. One of the participants was so keen to hold on to his beliefs that he started relating claims of supernatural powers from day one! He told us about a local bank employee who had converted a four year boy into a ten year old in four days. When asked for a demo he told us that the person would come the next day. On the next day he informed us that that person would not come but narrated an incident of rebirth of two decades back in which he said a 14 day old newborn started speaking. When asked to produce the now should have grown up baby he said the baby died at the age of twelve. On the last day of the training program he narrated a miraculous incident about himself in which he could eat ten kilograms of beaten rice in one sitting. When I challenged him to eat a tenth of that now, he told us that having lost that power he could not eat even a hundredth of that now! That was the end of the miracle man of Sitamarhi who was totally discredited by our insistence to test powers of the supernatural. Any way, I told the trainees that it was nothing new as every place had such claimants. The training program was attended by only teachers who had been deputed by the department of education with special leave. 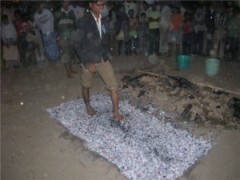 The last day of the program had a session at a nearby residential school with fire walking. In the semi urban and rural areas fire walking is compulsory as it is claimed as a miraculous power of some who could chant mantras and make the fire cool by their special powers. From Sitamarhi we proceeded to Bettiaha, the head quarters of West Champaran district. It must be recalled here that this district was the one where Mohandas Karamchand Gandhi had started his freedom struggle. The nearby district ,Motihari, was the actual place where he had started it . It is also known as Bapudham. When we reached there at the end of a tedious journey we found that the local organizers, the district unit of Science for Society, Bihar had invited school children for the training. In his youthful zeal, the local boy Roshan had also done the same. So, on the inaugural day we found a crowd of 80 young boisterous youth including a good number of girls. The trainees swelled to an impossible to control number of 110 on the second day. But, their enthusiasm was so much that we had no problems of any sort. The training program went on very smoothly and on the last day we were sure that a crowd of such youngsters could be also trained. There were a handful of teachers too. The youngsters were very keen to change the things which they had observed and were asking me for ways to do so. On the way back, we took a break at Patna to meet Prof. S.P.Verma, the mentor of the science movement in the region. He was very much for setting up a rationalist organization at the state level and has promised support in this task. He has plans to organize more such training programs in Bihar and also tours at the state level. Looking back at the history of our efforts, it started because of an incident which happened about 5 years back. A minister of state for the govt. of India had conducted a program in which he had honoured many so called Tantriks because, he claimed, they had supernatural powers. They had demonstrated them by walking on fire etc. That caused the director of the Patna planetarium to invite Premanand for a program there in which all these so called tantrik tricks were shown and exposed. During that time Prof. Verma had met him and asked for a training program at Patna for the members of his organizations. In this program Premanand and I had trained about 50 youngsters to perform these so called miracles etc. A few months later we had a tour of some of the districts of Bihar followed by the coverage of some more districts after about six months. As a result of these efforts we now have a group of young volunteers in Bihar ready to carry the message of rational thinking by demonstrations and investigations of paranormal phenomena. We are proposing to have a regional conference of FIRA (Federation of Indian Rationalist Associations)in that region in the month of June, 2009. The guardians of morality who have been the subject of a three part write-up have shown their true colors again by beating up women at a pub in Mangalore on the 24th Jan. The incident got national level publicity. The saffron gang desperate to grab power has been upto their usual tricks this time through a new organisation called as Sri Rama Sene. This was followed by an attack on a Kerala MLAs daughter for speaking to a boy of another community. The worst incident was one in which a girl committed suicide after being caught with a man belonging to another community by these very same guardians of morality. Looks like that the talibanisation of the district is taking place at a rapid pace. The so called guardians of morality, egged on by their mentors in the saffron gang, are being tacitly encouraged by the police who are taking very much delayed and diluted action, or none at all. There will be a youth protest against violence committed under the pretense of “preservation of culture”, on 20-2-2009 from 3:00 to 6:30 pm on Firday, in front of the DCs office at Mangalore. If you are in Mangalore you can join us in condemning “Moral Policing”. There will be training programs in Hyderabad on three days, from the 26th of Feb to the 28th of Feb. Interested parties can contact me on my mobile phone at +9194482 16343. The local organizer is Ajay Gandhi, ajay@wingsinfo.net. There will also be programs at Uttarkashi and Haridwar in Uttaranchal from 6th April to 15th April . The local contact there is Dr.Sharma, ecocampaign@yahoo.com, from whom details of the event can be obtained. Update: This is the fourth part in the series. Here are links to all the parts of Narandra Nayak’s rationalism tour of India:Intro, Part 1, Part 2, Part 3, Part 5, Part 6. Narendra Nayak’s Rationalism Tour of India- Part 2.
very nice attempt to promote noble cause of rationalism and scientific tamper. narendra nayak is spreading revolution across the country without taking any help from govt. or other activist other than local organiser . this kind of programme to b e organised all over the country to educate people against superstition and supernatural miracle and belief.I think media is also covering our programme and its indirect iffect is more valuable as those who could not participate in our programme they can be benefited by reading news from news paper and on TV channel. as we know It is the duty of the media to take up this issue prominently because accourding to model code of press they have to work for eradication of superstition and evils and illiteracy. I think If we interact with press with positive and proactive manner they will help to this humanitarian cause. This may not be a good place to ask but I was just wondering when the next workshop/seminar or meet will be conducted. I was unable to attend the previous one in Banglore, in the month of March.